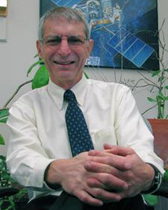 Mel Ulmer was a charter member and Co-Investigator of the Oriented Scintillation Spectrometer Experiment (OSSE) on the space-based Compton Gamma Ray Observatory. The Observatory was in operation until 2004. Ulmer has published over 200 articles in journals and conference proceedings. He divides his time between instrumentation development and astrophysical studies. His astrophysical studies have mainly centered around clusters of galaxies and pulsars. Currently he is analyzing data from the space-based Rossi X-Ray Timing Explorer (RXTE) on the Crab Pulsar. Ulmer's studies of clusters of galaxies have been concentrated on a survey of x-ray clusters, called SHARC. He has been developing technology to extend the operating range of x-ray mirrors up to 100 keV. This has lead to a contract to develop the technology for NASA's Lynx project. Ulmer is is a member of the Constellation X Hard-X-Ray Telescope Team. He is also working on developing UV solar blind detectors based on wide-band-gap semiconductors made with GaN. He has organized a team which has developed an innovative and unique design for studying transient phenomena in the hard x-ray sky. C. Adami, R. Scheidegger, M. Ulmer, et al. M. P. Ulmer, C. Adami, G. Covone, et al.